Keaton Wood could follow Calvin Davies back into the Rocks line-up this weekend as they look to strengthen their promotion bid by beating second-placed Haringey. The centre-half has been out for five months with an ankle injury but is close to fitness and could feature against the high-flying North London side – even if it is an appearance off the bench. Last weekend full-back Calvin Davies made his first appearance since before Christmas after a knee injury, the ex-Pompey academy defender coming off the bench to help Bognor to a gritty 0-0 draw at Bishop’s Stortford. 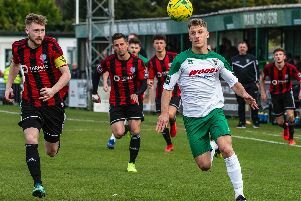 The same game also marked the comeback after injury of winger Mason Walsh, and Rocks boss Jack Pearce said the squad – although still missing some key men – was looking stronger just in time for the action-packed end to the season. The home tussle with Haringey, who led the table before Dorking’s surge to top spot, is followed on Saturday week by Worthing’s visit to Nyewood Lane for the much-anticipated derby and then, three days later, by the Rocks’ visit to Sussex FA HQ at Lancing for their Senior Cup semi-final againast Brighton under-23s. A third trip to the Amex Stadium final awaits Bognor in May if they can get past the young Seagulls, who beat Eastbourne Town 2-0 in extra-time on Tuesday to reach the last four. It’s the return to fitness of Davies and Wood which has lifted Pearce’s spirits this week as he anticipates a tough battle against Haringey. Pearce says that beefing up his squad will give him options and mean players will need to be in form to retain their place in the team. But he has all warned that Borough will be looking to put behind them a 3-0 defeat last week at home to Leatherhead. He said: “I am sure they will want to bounce back and they will enjoy our playing surface but it’s a challenge for us; it’s up there for us to go and do well and we know just how important the game is for both teams. The manager was delighted by the point brought home from Bishop’s Stortford, where the Rocks should they could dig in and manage the ugle side of the game. “To go there, still with some key defenders missing, when they had won their past three, and come away with a draw was excellent, even if it was not all that pleasant on the eye,” Pearce said. “Any point away from home I’ve learned to value.